The Sail Inn on Jefferson Boulevard is being reopened and rechristened as the Sail Inn Grotto & Bar. Launch date is late February. All aboard. The old Sail Inn, its full name The Sail Inn Food and Spirits, has been closed since August, 2013. That’s when Joan Washburn lost her lease to run the place, which she had been doing since 1986. The Sail Inn was a family owned property of the Kristoffs, best known for Bill Kristoff, the longest-serving member of the West Sacramento City Council. The new restaurant and bar retains a Kristoff family member, Ellie Marie, but now includes Archie Morse as the chief owner. The new management team also has equity in the business. A West Sacramento landmark, The Sail, as it was simply known to most folks, was a working-class bar that served good food and made people feel welcome. A port of call for many on a long Friday night, the bar appealed beyond its State Streets location to the greater Sacramento area. Although the exterior may have been rough, the bathrooms small and scary, the Harleys parked outside intimidating, few places had a greater charm for after work, after a River Cats’ game, or after the kids were left with the sitter. The new managers understand this. The Sail’s operating team are Garrett Van Vleck, Jason Boggs and Alex Origoni. They are behind the wildly successful and nationally recognized Shady Lady Saloon across the river. Van Vleck used to go to the Sail Inn. “I went there several times. In renovating the place, I think we kept a lot of the old roadhouse feel and the basic nautical theme, but we cleaned it up considerably and brought everything up to code. 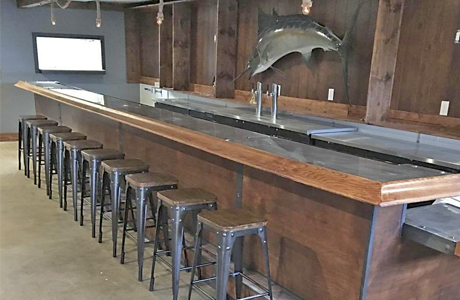 I hope the people in West Sac will appreciate the transformation and enjoy the nod to what it used to be.” He says there will be a varied cocktail menu and surf food to complement the sea-faring theme. The Sail Inn’s transformation may change its looks but not its destination to good times. Instead of a tramp steamer, perhaps West Sacramento will have a boutique cruise ship with a good living attitude. And a Mai Tai. All aboard. This entry was posted in Uncategorized and tagged dive bar, Sail Inn Grotto and Bar, The Sail, The Sail Inn, West Sacramento. Bookmark the permalink.